Let’s be honest, there’s a rocker in all of us, especially kids. Don’t you just get a kick out of kids rocking out to a drum beat. Their freedom to just move their bodies carefree is just electrifying. As is the line “Sandbox Rebel“. 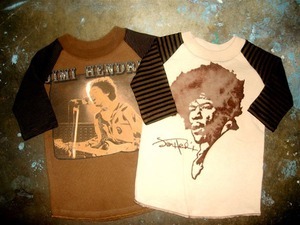 Personally, we’re BIG fans of their Jimi Hendrix shirts, but Sandbox Rebel has a shirt for every kinda rockstar. Come on, who doesn’t want to outfit your little dude or doll with the iconic Prince? Or what about a pint sized blazer and tie? We are just GUNS and ROSES over Sandbox Rebel. Call the band together! We’re headed to Sunset Blvd, with Sandbox Rebel. ← We love when our featured designers show love….